I came across this verse a couple of weeks ago and I’ve been thinking about it ever since. Affiliate links may appear on this page. See our disclosure page for details. Although this scene evokes emotion, it also makes me feel like the glory of God is something that is totally removed from life as I know it. This verse speaks the opposite. Glorifying God is the essence of life as I know it. That’s kind of mind-blowing, if you think about it. There is really nothing all that powerful about my life. It probably looks pretty similar to yours. I plan, I cook and clean, I shop for my family. I discuss homework with my son and try to plan dinners that will give my husband something to look forward to. Then I get in bantering conversations with my guys and have fun with my friends. I get stressed. I get joyful. And I try to find ways to share what’s on my heart, to make a difference. The thing is, the people whose words we read in scripture weren’t that different from us. There wasn’t anything spectacular about most of them…they simply trusted. They obeyed and persisted in doing what God called them to do. The difference is, He called them to do it in an extremely public way. So public, in fact, that we’re still reading about thousands of years later. We don’t always understand it, at least not fully, but we’re reading life as they knew it. But there are millions of others whose stories we haven’t read – millions whose lives, whose faith and obedience glorified God in a million different ways. You don’t have to be an Old Testament prophet to do that. And you don’t have to be an apostle, an evangelist, or a household name to bring glory to God. And you have to hold Him as your heart’s desire. He doesn’t ask you to be rich or famous or glamorous, though…he asks you to trust and obey. At times, we get tired. We feel like what we do just doesn’t make a difference, like it’s not going to matter in the long run. We feel unseen, unthanked, and unneeded. That’s not true, though. Trust, obedience, faith…they’re never unseen, and they’re never unneeded. And while the world might not thank us for them, it’s not the world we’re doing any of this for. When tiredness starts to set in and you wonder if any of what you do matters…it does. You may not see it, but it does. It matters to your family, greatly, and you will see that come to fruition in many ways in the years to come. And that is a pretty amazing thing to watch, I promise! But it also matters to God. When you decide that what He has given you to do is more important than what you might want to do, He is glorified. Who He is becomes center stage. The world sees Him instead of you – in a million different little ways. And that’s something they can’t ignore. You see, that’s the point of the whole passage that this verse comes from. It talks about a change happening “in that day.” In that day – the day that God’s people decide to follow His will instead of their own – the world will see Him. When you do the million little things you do, you not only serve your family and bring your children closer to a knowledge of God, you also bring glory to Him. You let the world know how real He is to you. And you teach your kids to do the same. 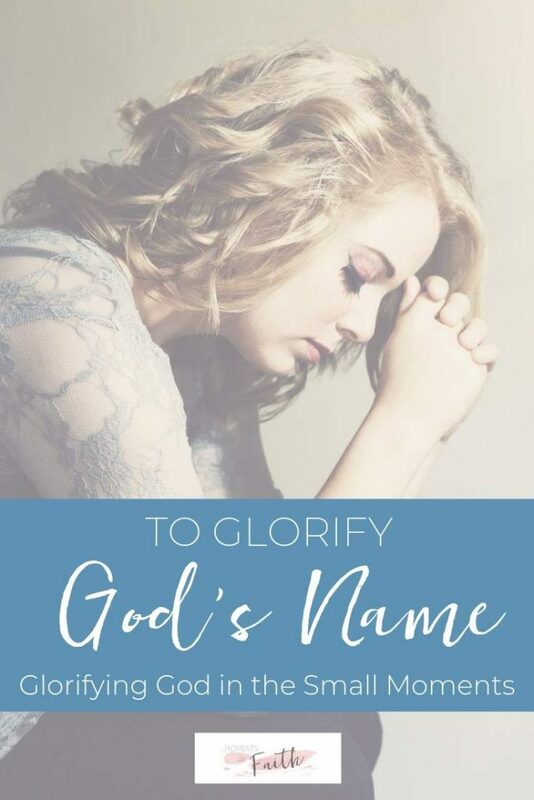 I don’t know about you, but I want that to be my heart’s desire – to glorify His name. I want that to be my overall goal. Whether that desire is accomplished through teaching my child quietly at home or through speaking to families around the world, I want that to be the purpose of my life. The world can have its accolades…I’ll take trust and obedience, any day. Even when it’s not fun, it’s more than worth it. It matters. And it’s enough.